I have decided to change the name of the thread. 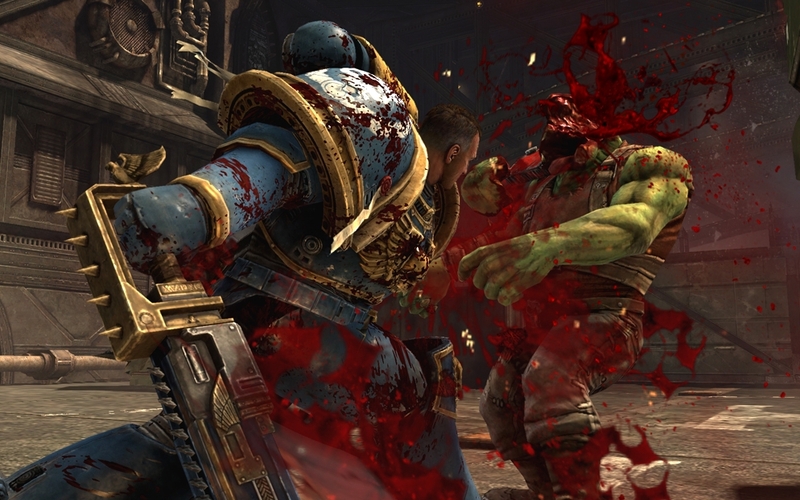 Feel free to throw up some Space Marine art here. Isn't this the 4th or 5th time we've changed it? Imperial Fists second-founders are the best second founders. By all means, call us the 'fancy lads who spend all their time on Holy Terra'. These guys aren't too shabby, either. Omg, I saw your sign tag for the 1st time and damn near shot my drink out my nose. Too damn funny and sooo perfectly true! That's some nice art there team. Even though I didn't mind the game (I thought it was great fun slaughtering greenskins), I don't overly like Ultramarines. I feel that they are a little overdone by GW, plus I don't like the whole coloured helmets thing (I know that Blood Angels have similar, I don't like that either, but they've got the Death Company...). If it was up to me, I would put coloured stripes on the helmets to differentiate. Red stripe for sergeants, red stripe with white outside for veteran sergeants, white stripe for veterans (for Ultramarines). 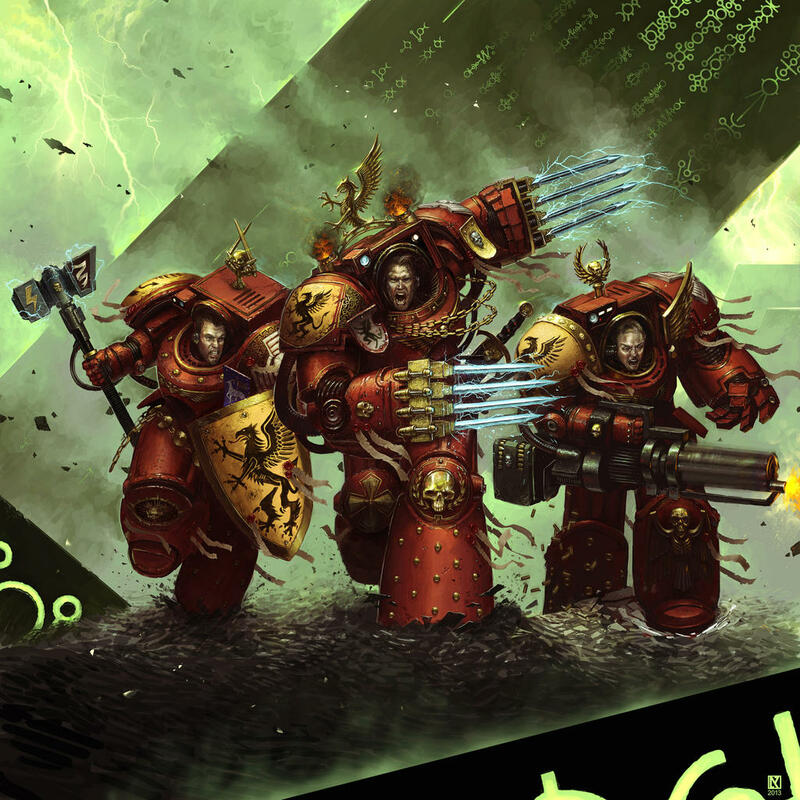 Would a red-armored Blood Angels sergeant have a red stripe on his red helmet? I get what you're saying...and having a uniform color throughout is nice. Personally I don't mind the off-colored helmet idea (Imperial Fists use white). I also like that there's variance from chapter to chapter - to me, it helps make it feel as if each is their own entity with their own heraldry and customs. As for stripes...I could have sworn this was already a thing? 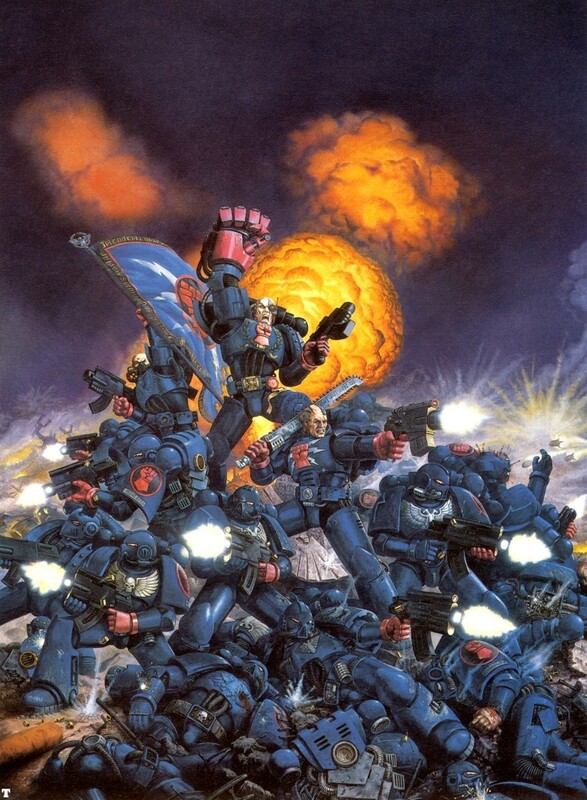 I can't remember where, or how, or when, or really if (lol)...but for some reason I thought there was at least one chapter where sergeants (not veterans) had chapter-color helmets with a single stripe, sort of like a mohawk. Blood Angels sergeants have black shoulder pads, but different coloured helmets for the marine type (gold for veteran, red for tactical, yellow for assault, blue for devestator). I just don't like the look of a different coloured helmet. For example - if I was to ever do a veteran sergeant Blood Angels assault marine, I would give him a red helmet, as opposed to the gold one. 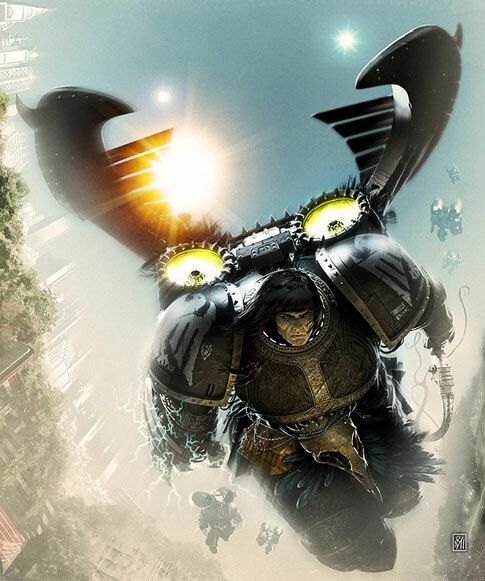 I feel that you should be able to tell the status of a Space Marine by the amount of bling that they have on the armour. Obviously, the longer that a marine has been around, the more extra details should be apparent (more gold details, special or unique wargear etc), and the more ornate the armour should be. Oh without a doubt - the level of ornate adornments should reflect the honor & service of the marine. 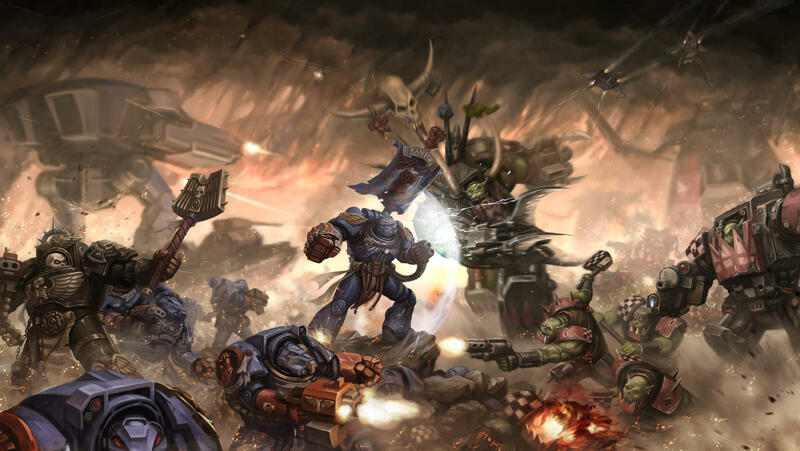 That's my kind of "devastators deploying..."
And an Ultramarine being a badarse. He's looking awfully shaggy up top for an Ultramarine ...maybe he's just a Novamarine that stole one of their banners? haha And as before: Imperial Fists Second-Founders are the best second-founders.